La Taverna dei Quaranta is a Restaurant Downtown Rome that has been active for several years and has had several changes over time until you get in the modern times where even offers an online booking service. But what makes the Taverna dei Quaranta tavern? In Italy and even more pleasantly in Rome is complicated to disentangle between the different types of places to eat. Whatever your choice, Italian cuisine is a guarantee of quality and taste but… let's find out the differences between the various dining places and why not, a powder” of their history. The tavern, in latino shops, are born in”ancient Rome as shops. In these small convenience store of”antiquity , the client had the opportunity to eat and drink. In the taverns Roman weary travelers could find not only dining but also a bed in the region. L”tavern: food, wine and something more. 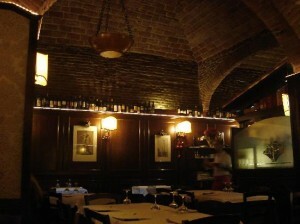 L”tavern, Today quiet restaurant frequented by all in the historic center of each city, It has a more risqué story. Although the inn has roots in ancient Rome, but above all in the Middle Ages that develops as an ancestor of”hotel. L”tavern, often located in places of passage for traders and travelers, with the passing of the centuries, becomes a place frequented mostly by male customers that, along with a glass of wine and chat, not above a certain “company”. Today”tavern has lost this connotation and ГЁ a gathering place where, albeit accompanied by food, the undisputed protagonist is the good wine. In the center of Rome, it can happen to stumble upon a more simple and familiar to a classic restaurant: the restaurant. The trattoria see – as mentioned its etymology reminds us- environments of the countryside and the genuineness of the simple life. The tavern, almost always family-run, is aimed at a popular audience, maintaining very low prices while offering high standards of quality and care of the dishes. The restaurant has almost always fixed menus of the day, created on the basis of traditional regional recipes. The center of Rome beats of pizzerias and restaurants-pizzerias that offer the most varied combinations for tourists and locals. The first pizzeria – according to tradition- born in 1830 a Napoli. Incredible, but true, era un takeaway! Only a few years after the pizza had the”idea of ​​organizing a real restaurant with tables and chairs to enjoy the comfort that will soon become the queen of Italian cuisine. Today, especially in the center of Rome, you can find many restaurants that combine traditional recipes with a”a wide selection of pizzas for every palate to reconcile with the quality and good food.